I have a daughter that rides and, as a mother I have a responsibility to keep her safe. With that in mind, the question of whether she should wear a helmet should be a “no brainer”, right? Well, as it turns out, the answer is not as easy at it seems. I don’t think I am alone in this dilemma either. Through going to shows and talking with various people I have found that the question of whether kids should wear helmets while mounted, either in or out of the show ring, is a topic of discussion. Beginning December 1st, 2005 it will be compulsory in all Hunter, Jumper and Hunt Seat Equitation classes, both open and breed restricted including Hunter Hack, where jumping is required and when jumping anywhere on the competition grounds (including warm-up rings) to wear securely fastened protective headgear which meets or exceeds ASTM/SEI standards and carries the SEI tag. According to Lexington, Kentucky neurosurgeon Dr. William Brooks, Chief Medical Officer at the Rolex Three-Day Event for the past 20 years; and former Chairman of the Safety Committee for the United States Pony Club, the vast majority of fatalities in horseback riding occur in falls with injuries to the head. In the past ten years Dr. Brooks has treated 187 head injuries which occurred in riding accidents. Of those the most consequential were concussion; fractures, which accounted for 35 injuries with none among riders wearing a helmet with a retention harness; blood clots, accounting for 35 injuries with 24 of those among riders not wearing helmets; and 27 fatalities, with 26 occurring among those not wearing a safety helmet. “The key is the retention harness and the appropriate helmet each time and every time,” said Dr. Brooks. · Riders are elevated 6 to 8 feet and at a hand gallop are traveling at 22 to 24 miles per hour in a forward position, they therefore have a substantially increased risk of a head injury, and that risk increases dramatically if they are not wearing a securely fastened safety helmet. · According to the American Medical Equine Association/Safe Riders Foundation, 20% of all equestrian injuries are head injuries, and 60% of fatalities are due to head injuries. When I was a kid, helmets were something nobody used unless you jumped or showed hunters. It was sort of like seatbelts in cars; they were available but just not used. Looking back, not using seatbelts as a kid seems like a stupid thing and as I watch my daughter ride now it seems equally as stupid to risk her life by not having her wear a helmet even though it isn’t necessarily “required”. It is a conundrum. Should she present herself like an assured rider that has control and can handle any situation that comes her way or do I require her to be protected in the event of an unforeseen accident? I also wonder what judges really think. I know that they theoretically cannot mark against use of a helmet, but do they unconsciously see it as a rider weakness? I am not saying that kids should or should not be required to use a helmet while showing. I figure it is up to the parents and their views on whether they think their child needs one. It is just one of those issues that I often think about. I don’t wear a helmet myself. I did when I jumped, but I do not now, nor do I want to. So I also have the ever present parental problem of “do as I say, not as I do” as part of the decision. I would love to hear from others grappling with this question. I too grew up riding both horses and bicycles without a helmet and without incident, even though I fell off a lot(the horses, not so much the bike.) Six years ago I fell off my horse and sustained a depressed skull fracture. I was not wearing a helmet. Fortunatly, I did not suffer any long-term consequences, but I did promise my family that I would start wearing a helmet when riding. Earlier this week I was riding outside, in a field, next to some woods. It was a little windy and my horse shied at something without warning. The predictable thing happened and I fell off. Initially, I landed on my feet hanging on to the reins, but then my bad knee buckled and I fell to the ground, pulling on the reins. My horse then ran right over me to get away from whatever had scared him. I felt his hoof hit my helmet. I’m pretty sure that if not for my helmet, it would have been my head that was hit and even though some might call me hard-headed at times, I can guarantee you it’s not THAT hard. Wearing my helmet saved me a trip to the hospital at the very least, and may have saved my life. On the other hand, I can understand the point of view of parents whose kids are showing. They have spent a lot of time, money, and energy to get their child into the show ring and want their child to have every advantage, or at least the benefit of the doubt. If they feel that their child is perceived by the judge as less competent, they will not insist that their child wear the helmet. Perhaps I was fortunate that my children do not share my passion for horses, so I never had to face the dilemma. The next step would be for the helmet manufacturers to design helmets for saddle seat and western attire. Don’t tell me that this can’t be done. 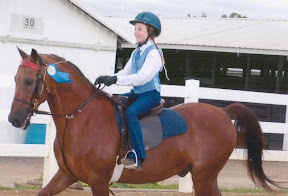 When I was showing as a kid, my saddle seat derby was a hard hat. It looked just like everyone else’s derby. It probably wasn’t very effective because it didn’t have a chin strap, but a chin strap made out of clear plastic would make a child (or anyone) safer than a soft derby. Are we as a society so stupid that we need to have things like seat belts and helmets legislated? Do we really want Big Brother telling us what we MUST do to increase our chances for survival? It took a depressed skull fracture for me to see the light. I hope that the rest of you are smarter than I am. Now that I have seen what my post looks like, I wish there was a spell-checker function. take that extra step to protect themselves & the ones they love. “Brain Buckets” as we lovingly call them here at the farm are required during lessons for all children. This should be a rule at all shows, horse functions, etc. No one would look out of place if we all were doing it. But thats what it will take…. a hard and fast rule change. One that I would happily sign my name towards. If adults choose to risk their necks, whatever. But we should take care of our kids. My kids are showing for the first time this year, and I would love to see helmets mandatory for all junior exhibitors!!! I feel compelled to comment as an almost-50-year-old adult – I have had the benefit of excellent trainers, patient instruction, and “solid citizen” horses – and I always wear a helmet! It astonishes me thatt helmets aren’t required in the show ring as well. I may be a minority of one, but I too dearly wish that helmets were the rule in all classes, for everyone across the spectrum of experience. Anyone who has seen the lifelong devastation wrought by even a “mild” head injury would attest to the fact that it is difficult to justify taking an avoidable chance, for the sake of fashion or any other reason. No wise bicycle rider, motorcycle rider, skiier or even skateboarder rides without head protection – why on Earth would we not want to protect all of our equine-sport participants as well? Horses are wonderful in every way – but they are also unpredictable, very stong, and incredibly fast animals and it is possible to have an accident – and when physics takes over, I want to at least have that helmet on my head. I am sure that my insisting on wearing protective headgear, including at every practice at all the shows, may generate some comment, but I will continue to wear that helmet all the time, every time. I would hope that more people will do the same. It’s simply a matter of reasonable safety. I grew up in 4-H, so helmets were required with mounted or driving; in hand didn’t require them. I’ve been out of 4-H for a year and I’m 20 years old, and i still wear my helmet when practicing. I wear my derby or western hat when i show, unless its an open 4-H show, then i have to wear my helmet. The only times i would wear a helmet at an open show was if my horse was acting stupid. I know in academy (at lease the shows i’ve been to), helmets are not require for kids (but they should be), but they are encouraged. I especially think they should be required for the 10 and under class. Kids think that helmets are lame, and i know, ive been there fighting with my mother over wearing helmets, but after i sustained a severe concussion, i thought differently. If I didn’t have my helmet on, i would have been dead. And to top that off, a year later i got another one! I can’t tell you how many fights i’ve been in on helmets and showing, most of the time it was at a 4-H show, so i could pull the “its the rules” card. I don’t see a reason why parents can’t have their kids wear helmets in the show ring. There is no rule saying that they are not allowed and its not saying that the kid doesn’t know how to ride, its stating that i love horses enough to keep myself safe. there is a rule (I know its out there somewhere), that a judge CANNOT rule against someone if they are wearing a helmet. If you can prove they did, they can be suspended. My mother always said when we fought about helmets and showing… “No Helmet, No Show” and it pretty much ended there. I think a person should have the right to feel safe on their horse, whether it be showing, or just riding in general.